Set in a parallel present, Humans returns for a second series and explores how the latest family gadgets, highly-developed robotic servants called “Synths”, affect and transform human lives, not always for the better. 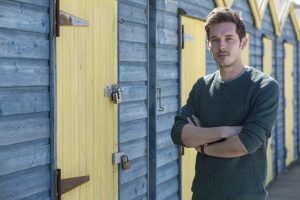 Series two picks up several months after the end of the first series – Niska (Emily Berrington) is still missing and her fellow synths – Mia (Gemma Chan), Leo (Colin Morgan) and Max (Ivanno Jeremiah) are still trying to find their place in the world amidst unconfirmed reports of synths behaving erratically. The award winning first series of Humans attracted an average of 4.8million viewers, becoming Channel 4’s highest rated drama in 20 years. The series stars Gemma Chan (Secret Diary of a Call Girl Jack Ryan: Shadow Recruit), Emily Berrington (The Inbetweeners 2 24: Live Another Day), Colin Morgan (Merlin The Fall), Katherine Parkinson (The IT Crowd, The Boat That Rocked), Carrie-Ann Moss (Jessica Jones, The Matrix) and Tom Goodman-Hill (Mr Selfridge, Everest). The production team filmed in Thanet between April and June 2016 using locations including Westgate-on-Sea – West Bay Café, Piggy Bank nursery, Station Road in Birchington and Botany Bay and Norfolk Road in Cliftonville. Westgate-on-Sea is a coastal town near Margate which offers a sandy beach, arcades, Dreamland amusement park, shops and restaurant plus the renowned Turner Contemporary gallery. Botany Bay is in Thanet and is a popular film location due to its blue flag beach almost 200m long with stunning chalk cliffs and rock pools. The Thanet area has previously featured on screen in productions such as The Lady in the Van (2015), True Love (2012) and Ruby Blue (2007). 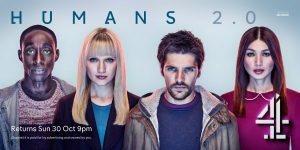 Humans series 2 starts on Sunday 30th October at 21:00 on Channel 4. This entry was posted in Filmed in Kent and tagged Botany Bay, Carrie-Ann Moss, Cliftonville, Colin Morgan, Emily Berrington, Gemma Chan, Humans Series 2 film locations, Katherine Parkinson, Tom Goodman-Hill, TV Drama, Westgate-On-Sea. Bookmark the permalink.